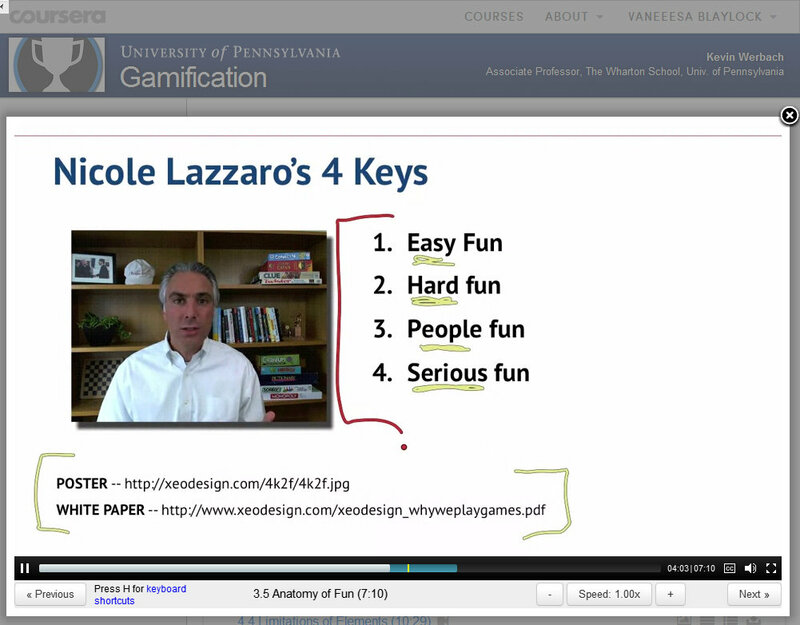 PHILADELPHIA, 9 September — Gamification with Kevin Werbach of the University of Pennsylvania’s Wharton Business School, Week 2! 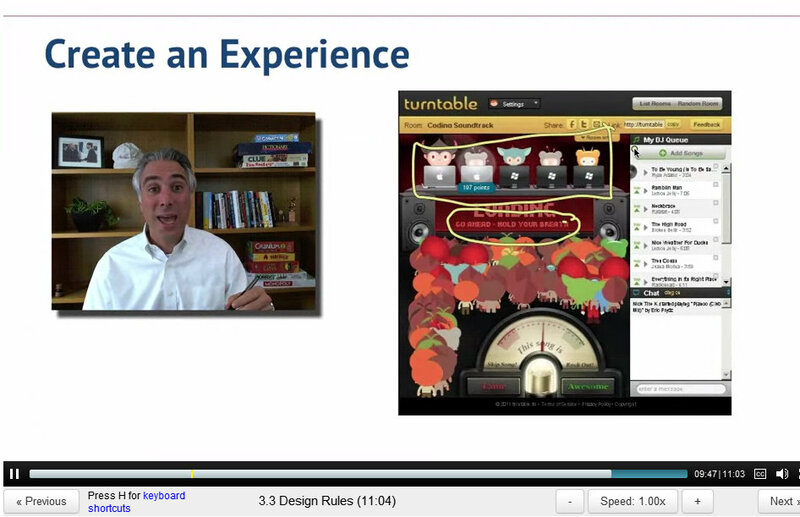 The ways game designers approach their craft is also the way to tackle a gamification project. Seeing situations through the lens of game design is an essential skill in this area. Understanding problems through the lens of game thinking. example: Dodgeball – one of first successful smart phone apps – successful, got bought by Google, but had “chicken & egg” problem. If you don’t already have a lot of friends, why bother checking in on a blank map. 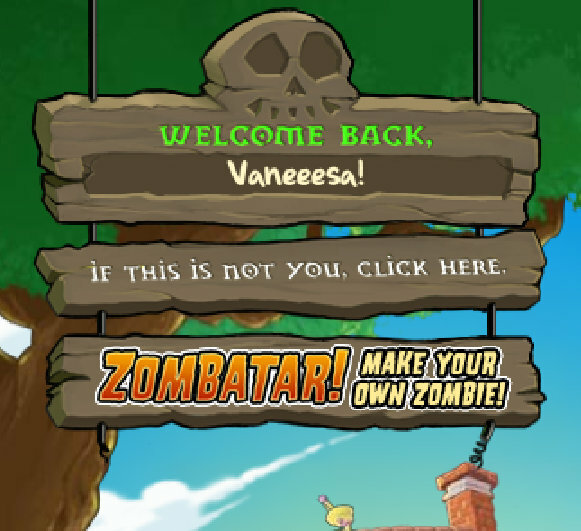 • Limited Choices (check in or don’t – a little analytics) Games with meaningful choices increase popularity. 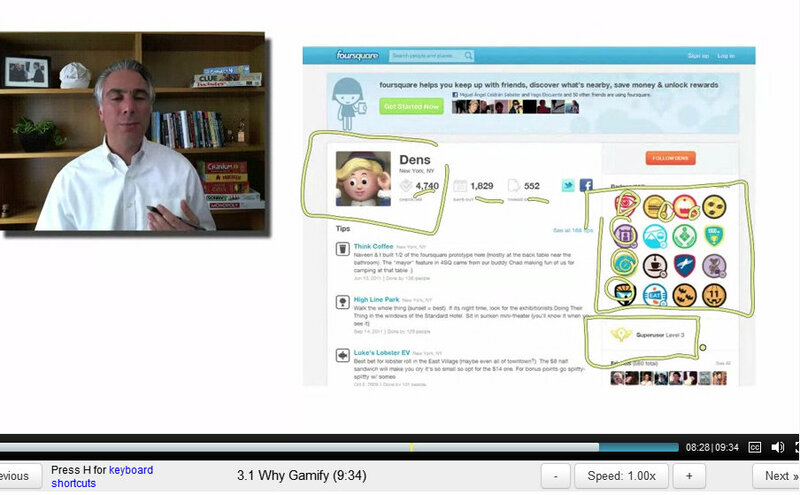 Dennis Crowley’s next app, Foursquare, implemented Gamification. Foursquare now has over 20 million users, 70 million in venture capital, valued at over 600 million. Gamification addressed engagement gap, habit formation, etc — that’s the thought process for approaching problems through the lens of game design. 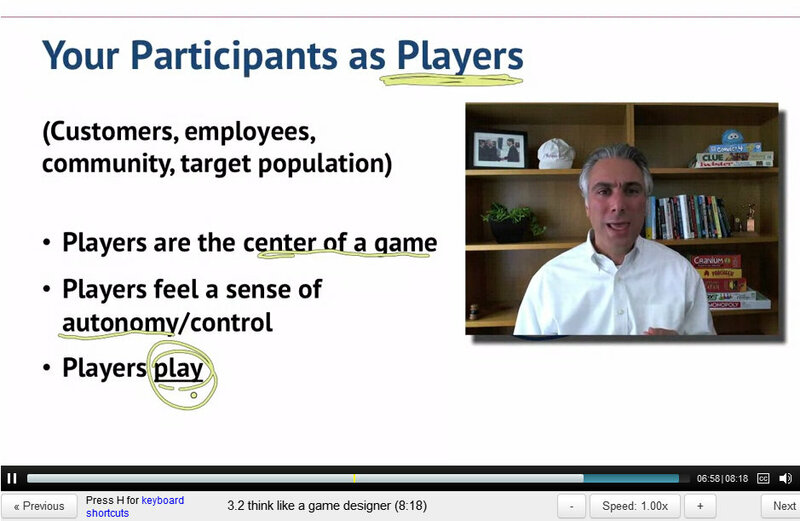 The key skill in gamification! >> Game design is a state of mind – we’ve all done this before, it comes naturally to human beings. It’s a skill that we can cultivate. Resolve that you’re going to look at your problem as a game designer. Whatever your goal may be. Think about it as a game. What would you do? hahaha > fun, easy & satisfaction! a lot of game design is about ensuring that the game is constantly In Balance – tricky! – real people – never know what they’re gonna do – lots of testing! Monopoly – challenge is keep property prices in balance so it can still be fun for all the players. Pass GO, get $200 – why? Balance! Game has to keep the economy in balance. Too much initial money : inflation. Not enough continuing funds: recession. example: Turntable.FM – not just listening to music, but “in a club” – involved not just in sitting and listening to music in your home, but AN EXPERIENCE. Not just clicking on iTunes tracks. Game like experience around picking music and listening to it. What Makes Games Engaging? >>> FUN!!! For a game, business process, or some objective – how would use these different kinds of fun to engage peeps in the activity? 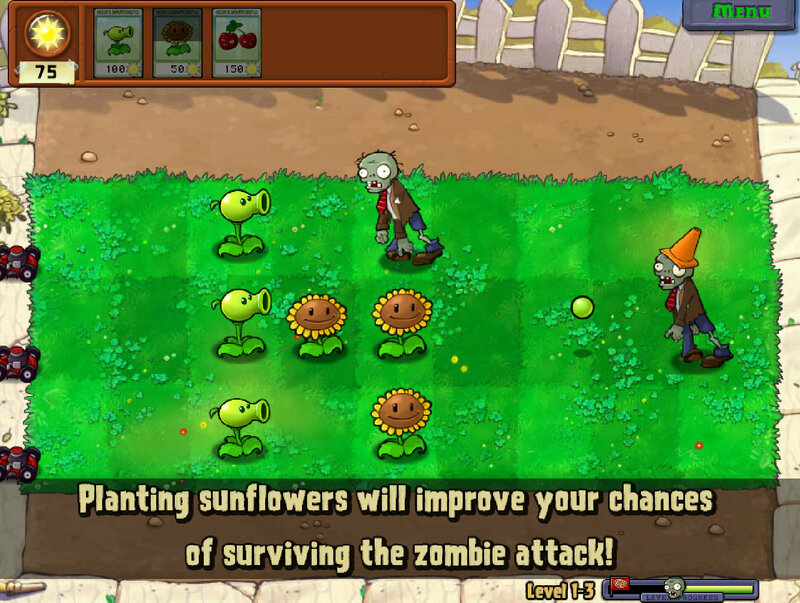 Nicole Lazzaro’s 4 Keys – what in games actually produces fun? Raph Koster – book – A Theory of Fun for Game Design < good! 1. Fun must be DESIGNED! You can find fun in unexpected places. ex: LinkedIn profiles – more full profiles with more details makes better networking and more likely to upgrade to paid services and more data for LinkedIn. No. They didn’t create a profile game. 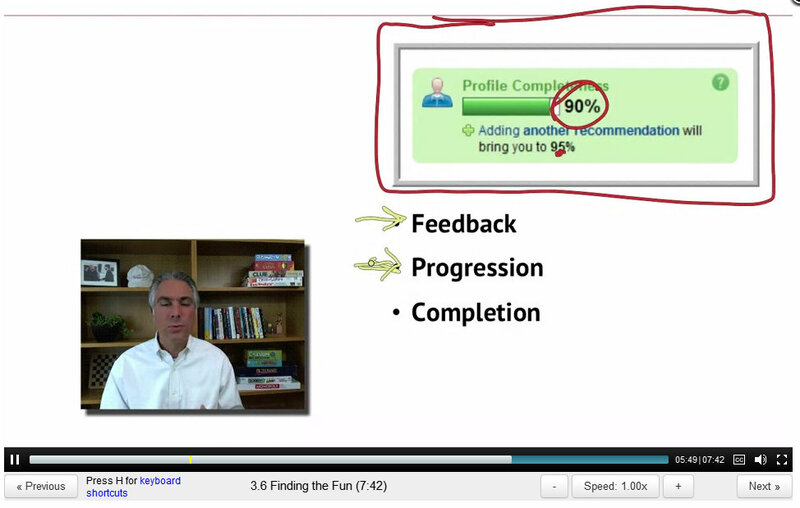 Just a “Profile Completeness Thermometer” — is that a game? Not really… but it’s a little bit fun… just enough to encourage people in meaningful ways. ← Open call to participate in a study on avatar identity through USC!! The bottle game looked fun! One thing we were told, was also to take into consideration situational awareness, not that it’s a huge issue in this case. But for example, if you make a single player mobile app game that requires the sound on or for you to add voice input, people are not likely to want to play that in public. Play has an aspect of performance in it, so if I imagine I need to take the bottles out, and I’m alone, I might go for the normal one to not draw attention to myself and suddenly become a street-bottle-dance-performer. A game that emphasizes performance is for example Guitar Hero and Sing Star. Is it gamifying music? Is Guitar Hero just about memorizing a certain sequence and tempo of pressing buttons or is it playing air guitar on an advanced level? Half the fun of those games is the performance, but how to use play-performance is also something to consider. I also wanted to raise another point with the “What Things are Fun?” list. I get the impression Kevin Werbach is an optimist because he left out a huge chunk of gamer motivation, and SL residents will surely be familiar with it – griefing and ganking. Richard Bartle’s old gamer typology lists “Killers” as the fourth type. PvP and player-competition is common areas for Killers. An older generation MMO such as Ultima Online allowed for more grief-like actions than WoW for example. (Such comparisons raise interesting questions about what is considered griefing and how code and technology comes into it). As you can imagine, catering to this kind of fun will chase away certain other players, but when designing a game, always take into account how a griefer/cheater might play it.